How questions are phrased in a survey is important, as any market researcher or social scientist will tell you. And appearing early on a list matters too. One Irish TD even went to court a few years ago to argue that when arranging names in alphabetical order, the returning officer should ignore the Ó at the start of his name. So consider the following: the number of people who answers “No religion” in reply to a census question in the UK is 14.1 million, one in four of the population (25% in England, 37% in Scotland, 32% in Wales, 7% in Northern Ireland). 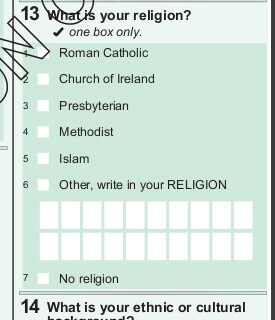 Meanwhile in the Republic of Ireland, the number answering “No Religion” to the census question is 4%. (And that figure is also a matter of debate). Now take a look at the two forms below. Above: Religious question in the Irish census. 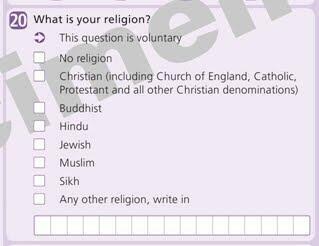 Below, the religion question on the UK census form.